My hometown (and the hometown of many Knights as this is the place where the Knights of Moleskine, Spirit, and Ale started) isn't really known for too much. I was, thankfully, recently reminded of an Evansville story that has positively touched the lives of innumerable families -- especially children. 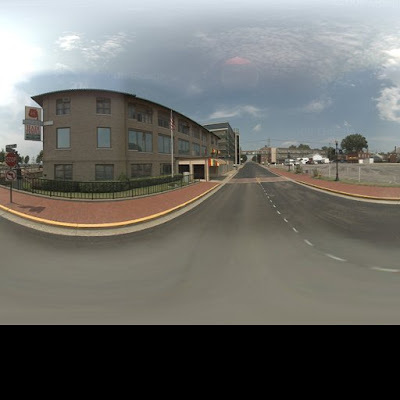 If you take a walk long our river front, you'll see a building that is home of Evansville's Ancient Arabic Order of the Nobles of the Mystic Shrine for North America (A.A.O.N.M.S.) -- better known as Shiners, or Shrine Masons. 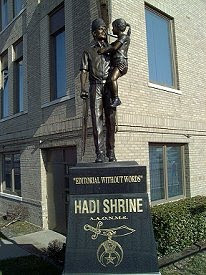 The Shrine is an international fraternity of approximately 775,000 members who belong to Shrine Temples throughout the United States, Canada and Mexico. Founded in New York City in 1872, the organization is composed solely of 32nd degree Scottish Rite Masons or Knights Templar York Rite Masons. Okay, what's up with that? Why Do Shriners Wear A Fez? The red fez with a black tassel, has been handed down through the ages. It derives its name from the place where it was first manufactured - the holy city of Fez, Morocco. The fez was chosen as part of the Shrine's Arabic (Near East) theme, around which the colour and pageantry of the Shrine an developed (but, I digress). And the Shriners are best known for its official philanthropy, Shriners Hospitals for Crippled Children, which is often called "the heart and soul of the Shrine." Shriners Hospitals for Crippled Children is a network of 19 orthopaedic hospitals and three burns institutes, maintained and operated by the Shrine, where children under the age of 18 receive excellent medical care absolutely free of charge. Shriners Hospitals are located throughout North America, with 20 hospitals in the United States and one each in Mexico and Canada. The Shrine supported various charities almost from its inception. In 1920, however, the organization voted to adopt its own official philanthropy, dedicated to providing free orthopaedic medical care to children in need, and the first Shriners Hospital for Crippled Children was built in Shreveport, La., in 1922. The Shrine's philanthropy eventually expanded to 22 "Centers of Excellence," including its three Shriners Burns Institutes. There is never a charge to the patient, parent or any third party for any service or medical treatment received at the hospitals, and no state, local or federal funding of any kind is sought or accepted by Shriners Hospitals. Now, it's time for me to disclose that I AM NOT a shriner. So why this post today and what's the connection to Evansville? and when you look at the above Shriner's Hospital logo you'll see a similar image. Those images are directly taken from a photograph. A photograph that was taken 40 years ago right here in Evansville, Indiana. A photograph that has become one of the best recognized symbols of Shriners Hospitals. The photo known as the "Editorial Without Words" was taken almost by accident. Randy Dieter, the photographer, recalled that in 1970, he had been on assignment covering the local Shrine Temple's annual outing for handicapped children at the now-defunct Mesker Amusement Park in Evansville. "I was taking shots of the midway and was using my telephoto lens," Dieter said. "I saw a local Shriner walking by carrying a little girl in one hand and her crutches in the other. My camera wouldn't fire. "Then they were too close for my lens. I ran past them, but the camera jammed. I had to take my last shot as they walked by. It was the end of the roll. If I had to think about it, I wouldn't have come up with something like that. Fate guides you." "It still seems unreal," said Bobbi Jo Wright, the little girl in the photo. 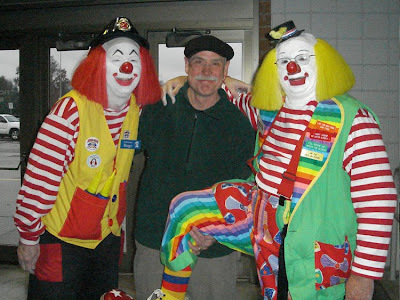 "I have many wonderful memories of the years I was a patient at the St. Louis Shriners Hospital and remember all the fun activities. I was born with cerebral palsy, which resulted in many orthopaedic problems that made walking difficult. I had many surgeries at the St. Louis Hospital. They greatly improved my ability to walk." I was reminded of this story when I read a letter to the editor yesterday in our local paper. The Shriner who was unexpectedly immortalized carrying Bobbi Jo was Al Hortman. According to the letter (written by Al's daughter Julie) Al used to joke that he had the most famous rear-end in the world. Now, Al also owned the local franchise called Biff Burger (Biff = Best In Fast Food). 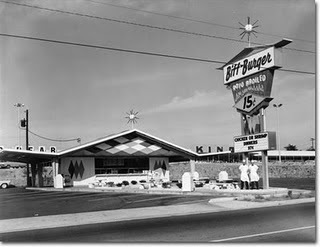 Biff Burger was always a real treat for our family. A few years ago on a trip to Florida, I drove Lady Suzanne and our girls a couple hours out of the way to visit the last remaining Biff Burger stand in the country. I loved that place so much as a kid that I named our Sunday night bowling team after it, The Biff Bunch (But, again, I digress). Back to the photo. What Mr. Hortman appreciated most was the photo's real significance: It represents every Shriner and any child. I'm sorry to report that Al passed away recently; however, his silhouette and memory will live on. Why? Becuase the image -- An "Editorial Without Words" -- perfectly illustrates the Shrine slogan: "No man stands so tall as when he stoops to help a child." No, I'm not a Shriner, but I belive that we can all find ways to honor Al's memory by, from time to time, stooping down to help a child. he can take so many parts of his/our lives and combine a blog writing to share with others! He truly is able to show himself and his huge heart in the writing he shares. As I read through it I see parts of walks downtown, the circus we attend every year, vacations with our daughters, bowling league, even remember him making the infamous Biff sauce in our kitchen, and many more... ending with reading the paper last night and saying "did you see this letter the editor?" Then taking the time and skill to put it all together, complete with visuals for the blog. Great job! Excellent work Sir Bowie! I have driven by the statue too many times to count without a thought...now that image is burned into my hear and soul thanks to you. I have an older friend from Church who is a Shriner and drives the van to take children back and forth from her to the St. Louis Shrine Hospital for Orthopaedics. Big hearts, great hats and a thirst for life, laughter and beer! Um...perhaps we need to join these Mystic Knights?! Thank you for this tribute to my father. The pictures of the Biff Burger really take me back.